Dak, Sera and Riq are still travelling through time and around the world trying to patch up glitches in history before their world of the future falls apart. In The Trap Door they are stranded in the United States in 1850, and caught up in the slavery wars. Falling into a trap, they are captured and Riq is to be sold as a slave in the markets where he meets some of his ancestors. Dak and Sera escape but sensing that he is close to solving his ‘remnants’ (the horrible waves of despair that overcome the children sometimes), Riq chooses to stay to help his ancestor avoid the destiny he knows awaits them. In this time period, the children have difficulty telling the evil SQ apart from the freedom fighters who trying to wrench the underground railway back from SQ control. Not knowing who to trust makes their work even more dangerous than ever. The Trap Door continues the multi-platformed adventure series, Infinity Ring. Following the formula of the popular 39 Clues series, each book is written by a different author and continues the adventure undertaken by three children in an effort to save the world. 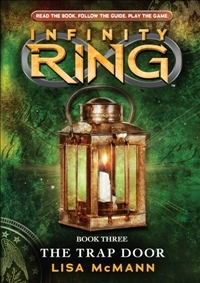 The top secret clue to be opened at the conclusion of the story gives access to a new adventure on www.infinityring.com which the reader may then embark upon while waiting for the next instalment of the series. This is a thrilling adventure ride for eight to fourteen year olds which promises many more journeys to come.